With recent success, you’ve are now looking to spend some marketing dollars to build on and improve your hotel’s popularity. Or, perhaps, your marketing efforts to date have felt more like doing whatever it takes to keep your head above water, rather than a planned and well-executed swim. Whatever your motivation, this boutique hotel marketing plan template will help drive your marketing success. By focusing your marketing efforts and creating a schedule of specific actions, you have clear direction in the tactics needed to achieve your marketing goals. 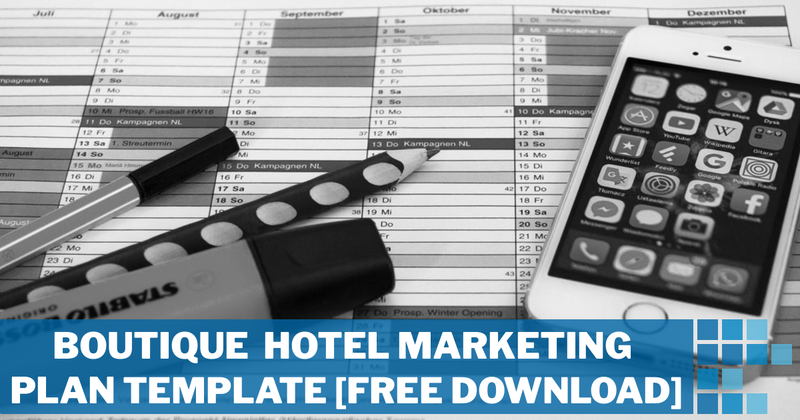 Click below to download to your free boutique marketing hotel plan template. This sample provides a framework for you to create your marketing plan, with areas to record specific marketing goals, tactics, budget, metrics, and a schedule of events. Before you read the guide below on how to fill in your sample boutique hotel marketing plan, take a look at the following posts (if you haven’t already). How to Develop a Winning Boutique Hotel Marketing Strategy. Your strategy is the cornerstone of your marketing efforts. Through the investigative work you do to understand your audience, analyze your business and the competition, and define your goals, you lay a solid foundation on which to make any marketing decisions. 5 Steps to Creating a Boutique Hotel Marketing Plan. While we’ve done the groundwork and created a boutique hotel marketing plan template for you, this post outlines the thought process and actions needed when selecting the right marketing tactics, budgeting for your plan, scheduling activities, measuring your success and reviewing your campaign. Consider it the companion document to this post. An outline on how to fill in the five sections of your boutique hotel marketing plan template, and why each section is important, is provided below. To help get you started, we’ve included screenshots with text that could reflect some of the details you include in your plan. What to do: Paste in the goals from your marketing strategy. If you’re creating different plans for each area of marketing, such as social media or strategic partnerships, only include the relevant goals for the type of marketing mentioned in this plan. Why: It’s important to place your marketing goals prominently as a reference to guide your marketing decisions and ensure you are working towards meeting your objectives. By documenting your goals you are more likely to achieve them. What to do: List the specific marketing tactics you’ll implement and the tools needed to complete them. It is also useful to list who will be responsible for each action. Why: Identifying the specific actions you’ll take provides focus for your marketing efforts and helps you to stay on track. Listing who is responsible for each action removes ambiguity and provides accountability to ensure tasks are being done. With enough detail, your marketing plan can be implemented by any of your hotel’s team, which means the campaign can proceed as planned in the absence of a team member. What to do: Record each individual marketing tactic and the budget required (either known or anticipated). The prices included could be ongoing amounts, such as a monthly subscription to Hootsuite, one-off costs, or total spend for the duration of the campaign. What to do: List each tool and benchmark you will use to track the success of your marketing plan. Identify what data you will be monitoring. Why: When you analyze metrics, you are assigning quantifiable values to your marketing efforts. Using data collected by various tools, you can measure how successful your marketing tactics are and justify how they are contributing to increase in bookings or revenue for your hotel. What to do: Fill the table with the specific marketing activities your team will do to achieve your goals. Include items to review your progress by collecting and analyzing data. There are numerous ways to fill the schedule section of the marketing plan and we recommend you choose the strategy that is most suited to your plan and marketing tactics. Organize the columns in weeks or months. Currently the schedule is set to one column per week, for thirteen weeks. This gives you with a quarterly marketing plan. Alternatively, if your marketing plan is less involved, you may want to assign each column to an entire month. Assign each row to a different, general marketing tactic, or to specific actions. 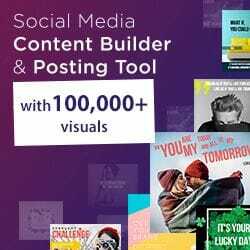 Using the weeks or months as your columns, each row can then be assigned to either general marketing tactics (social media, content marketing, paid advertising etc.) or specific marketing actions (Instagram engagement, email, speak with tour operators). How you decide to label the rows will depend on how detailed you want to be, and what is involved with each type of marketing tactic. Another approach is to organize your schedule around the different promotional offers you’ll advertise across the year. Why: Planning your specific marketing activities and when you’ll complete them means that marketing shouldn’t fall to the wayside when things get busy – a filled in schedule of daily, weekly, or monthly tasks allows you to implement tactics quickly, without having to decide ‘what to do’ in the moment. You’ve completed your boutique hotel marketing plan template and should now have a thorough guide to direct your marketing actions. As you work through your plan, don’t forget the importance of monitoring your progress against the key metrics and benchmarks you identified. Achieving marketing success with the help of our template? We’d love to hear from you! Let us know on social media, or share this post with your team using the buttons below.